You are here: Home / Archive / Seeking a speed bump? Brennan Woods Drive has wide straightaways that lead to speeding. A traffic calming study recommended the installation of speed humps to slow drivers. Is speeding a problem through your neighborhood? Do drivers use your street as a cut-through? Do you ever wonder how to convince town officials to install speed bumps or signs to slow drivers? According to members of the Williston Selectboard, an increasing number of neighborhood groups are having these conversations, and the board is considering a policy to standardize how traffic control requests are evaluated and which traffic calming measures are warranted. Work on a standardized policy began after residents of Brennan Woods Drive and Chamberlain Lane successfully lobbied the town to study the speeding situation there. The two roads form a neighborhood that lies between Williston Road and Mountain View Road. The speed limit in the neighborhood is posted at 25 mph, but wide streets and long straightaways lead to speeding problems. The road is also used sporadically as an alternative to Route 2A for north-south traffic. 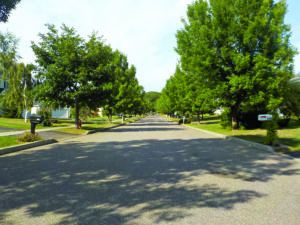 The town hired Stantec Consulting Engineers to complete a speed and traffic calming study. The study found that a majority (85 percent) of Brennan Woods and Chamberlain drivers travel between 32 and 34 mph. Bryant also determined that about 15 percent of the traffic — roughly 20 cars — was cut-through traffic during one afternoon rush hour. The study recommended installation of up to six “speed humps” in the neighborhood. The selectboard was reluctant on Tuesday to move forward with the recommendation before a formal traffic calming policy can be finalized. Permanent speed humps come at a cost of about $15,000 apiece, Public Works Director Bruce Hoar said. The board agreed only to install lower-cost temporary speed humps that can be removed in the winter — and evaluate their effectiveness. The board also agreed to install “share the road” signs at Maple Road after receiving speeding complaints from residents there. Under the new policy, when residents come to the town seeking fixes for neighborhood speeding, town officials will first try low-cost solutions like increased police presence and placing a temporary speed feedback sign. They will also determine whether a speed study is warranted. If the town proceeds with a speed study, its conclusions may lead to a more intensive response, said Erik Wells, assistant to the town manager. Another factor will be resident engagement. “A neighborhood traffic calming committee should be developed … providing a link between the neighborhood and the town,” the draft policy states. A second tier of response would include installing signs, road markings and temporary speed humps that can be evaluated over a period of one to two years. “Feedback will be sought from the neighborhood after the assessment period to help determine whether any temporary physical roadway enhancements implemented should be permanent,” the policy states. A third tier of response would include a comprehensive engineering study and installation of speed humps or other permanent road changes. Williston Fire Chief Ken Morton argued for the prioritization of signage, education and enforcement. Speed bumps, he said, cause a variety of problems for fire and rescue vehicles. They increase response times as emergency vehicles slow down to handle the bumps, they interfere with patient treatment in an ambulance and they increase vehicle maintenance costs, Morton said.